It's 7:30 am and the Ultrabirken 2014 is delayed because of port-a-potties that never came. There is only one toilet for over 200 runners, and the race direction has decided to let everyone standing in line have their turn before we start. I imagine a truck filled with port-a-potties arriving a couple hours later. "Who ordered all of these toilets?" the truck driver will yell into the sunshine. To no one. The loudspeakers provide running commentary of the toilet situation as I nervously jog in place. I am, as they say, chafing at the bit. I am raring to go. I am ready. The competition around me looks serious. Everyone is sinew and muscle, lycra and hydration systems. There are mostly men. I wonder how many of the women I can beat. Finally, at 7:45 am, the final racer leaves the bathroom, and the loudspeaker counts down. "3-2-1-GO!" And we are off. I am standing towards the back of the field - I hate being forced to go too fast at the start of a race. The pack of racers slowly shuffles to a jogging start, trotting out of the cross-country arena and along a gravel road. Our steps crackle loudly in the otherwise quiet morning. We hit the first slight incline, and most of the people directly in front of us start walking. I skirt by them and keep jogging. Maybe I should be walking, too? I thought. But it seemed silly, so early in the race. The gravel road turn onto a narrow, rocky trail, and the incline increased. I began power hiking, which on that kind of terrain is basically as fast as running but conserves energy by avoiding bouncing. I'm so excited, too excited maybe, and I glance behind me to look for Dad. He's coming, dodging people and trotting up the trail. We skim the top of the hill, chatting, and I am glad that I'm not going at this alone. The trail heads downhill and I feel like an excited puppy. I leave Dad behind as I bounce down. At the bottom of the hill there is a lot of mud. I slide in it and fall down on my knee. Not hard, but hard enough to give me a warning. Don't start falling all over the place this early in the race, Molly. You have a long way to go. I slow to a more conservative jog and let Dad catch up with me. We have an agreement to stay together for the first 30 km. Then the real downhill starts, and I have the advantage. At the first aid station, we stop to take off the long sleeved shirts we started with under out t-shirts. The day is warm already. The weather forecast lied and told us that the morning would be cold. 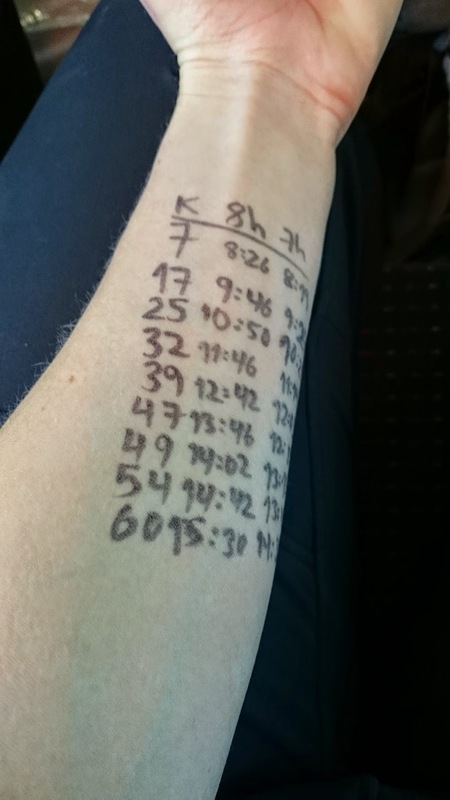 My arm tells me what time we have to be at different aid stations to finish in 7 hours, and to finish in 8 hours. The times are now wrong, because we started 15 minutes late. This is ok though, because it gives me something to focus on while I run. Math is a good distraction. At the km 7 aid station, we are nearly 10 minutes ahead of 7 hour pace. I'm not sure if we have started too fast, because I feel good. We agree to keep going at the same intensity. As we head up the dirt road from the first aid station, Dad starts chatting with a fellow racer. He is from Belgium, but lives in Trondheim. They talk about how hard it is to be tall. They talk about how hard it is to be old. They say things like 'if I were still 23' while they glance at me knowingly. I think they are being silly, because of course they are running with a 23 year old. The trail we turn onto is brushy. I wonder why no one has cut down some of the prickly bushes that grab at us as we run by. Still, it is a beautiful day, and we are making good time. 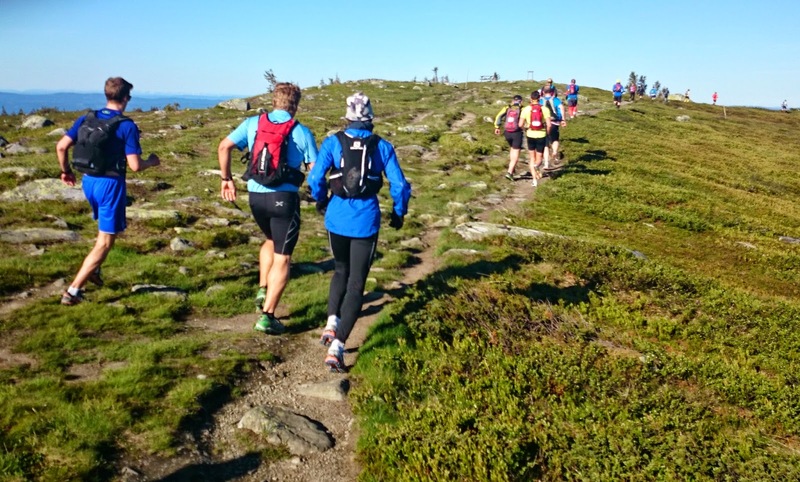 We pass through the 17 km aid station, and I eat a banana. I watch my watch, and follow my rule of eating sometime every hour. When I ran my first marathon in 2010, I bonked hard, and I have resolved to never do that again. The rolling terrains gives away into a longer climb. We are headed up Hitfjellet. I slow to a power walk and try to eat a brownie. It feels awful in my mouth, like cement. I hope that I have a enough gels. They feel like glue in my mouth, but glue is easier to swallow than cement. Racers headed up Hitfjellet. Dad is on the left in the dark blue shirt and red shoes. 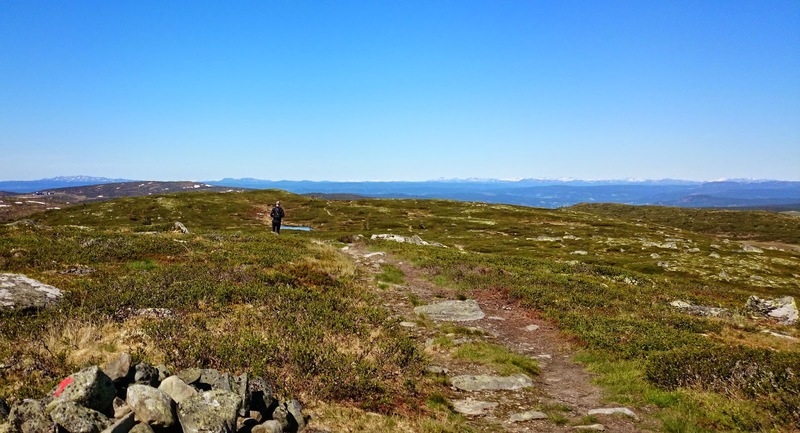 At the top of the climb, the landscape is expansive and we can see snowy mountains in the distance. The air smells like heather and sun-warmed rocks. It is getting hotter, and I wished I had worn shorts. I am faster than dad on the downhill from Hitfjellet. 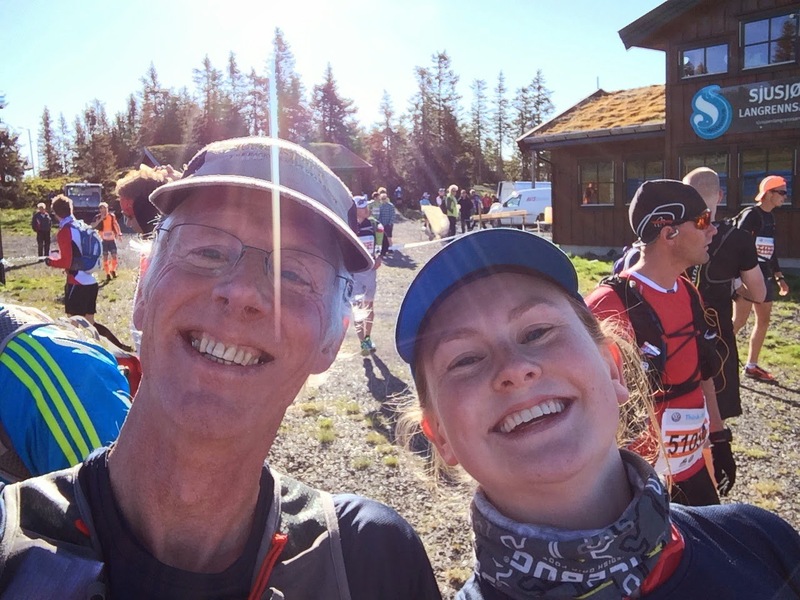 I slow down as the trail flattens out and heads slightly uphill to towards the aid station at 25 km, and let Dad catch me again. We see a dead lemming in the trail. We joke that that is what we will call the rock band we will start. Dead Lemming in the Trail. At the km 25 aid station, there are racers sitting on the ground, eating. They are handing out sandwiches. I don't want a sandwich. Sand wich. It sounds hard to chew. Dad has a sandwich with cheese, but I tell him that we have to keep walking while he eats it. I don't want to get stuck in an aid station. I eat a banana, and hope that I am eating enough. The trail starts to climb again, towards the highest point of the day, Nevefjell. This time I have no qualms about walking. If I remember the profile correctly, after the top of this hill the rest of the course is almost all downhill. There is still a pack of racers around us. I wonder how many are ahead of us and how many are behind. I think the race is pretty spread out by now. At the top of the hill, I glance back at Dad, who is 10 meters behind me. It serves as a sort of diffuse farewell. The downhill is rock-strewn and technical, and I know he won't keep up with me. Now I am alone. All of the racers I say going up the hill have spread out. 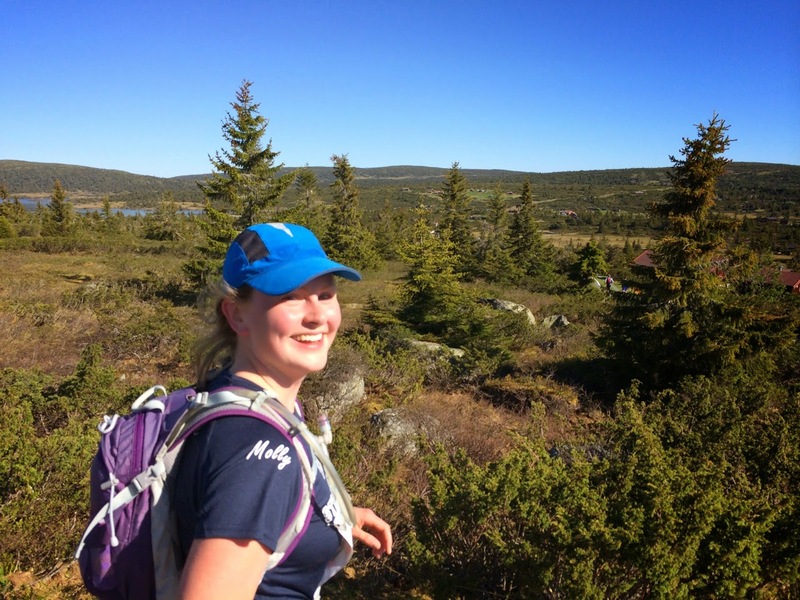 I arrive at the km 32 aid station. There is a man waving his bare foot around in the air; he appears to have ripped most of the skin off of his big toe. I shudder, grab another banana and trot off. 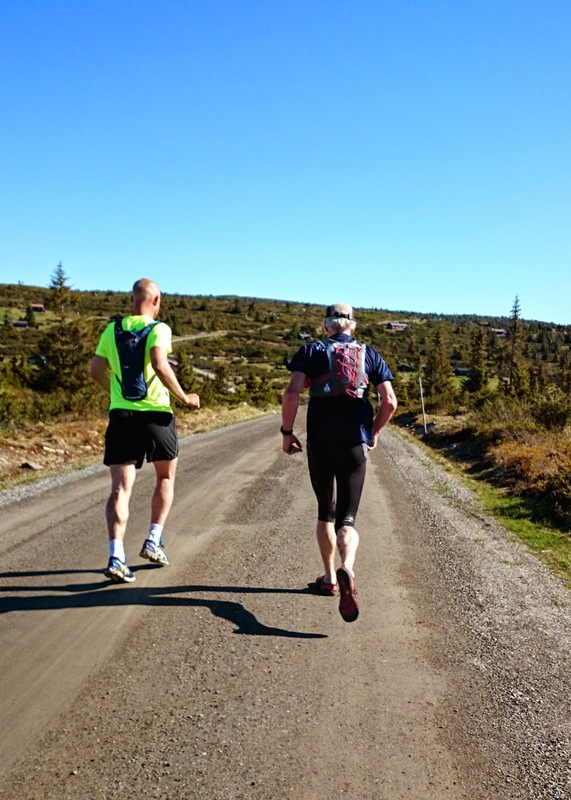 I start running with a Dutch man who owns a cabin by Sjusjøen. 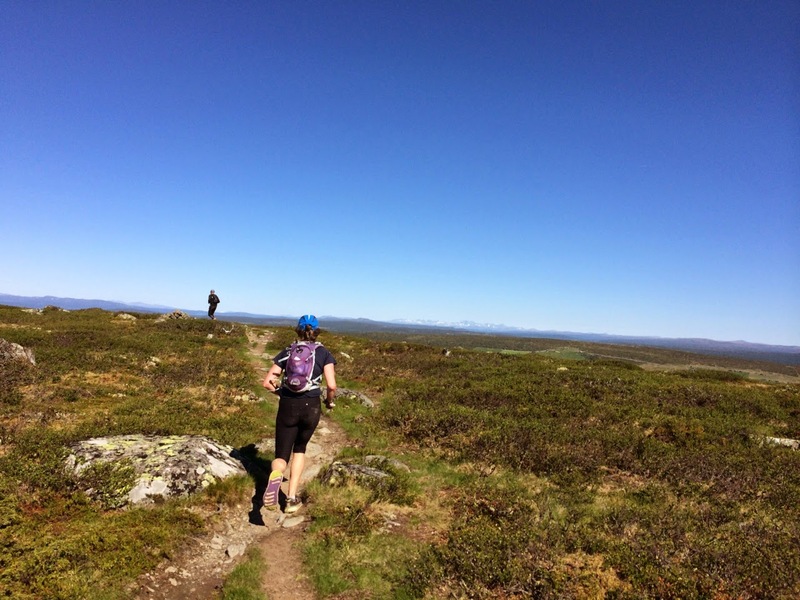 He is a cyclist, but decided to race Ultrabirken on a dare from a runner friend. I tell him I bike a lot too, but that I have been running a lot since the beginning of March. "But we're doing alright, right?" I say. "Yes, well, we won't have the fastest times. I guess somewhere around 7:30," he says. I think this sounds about right. 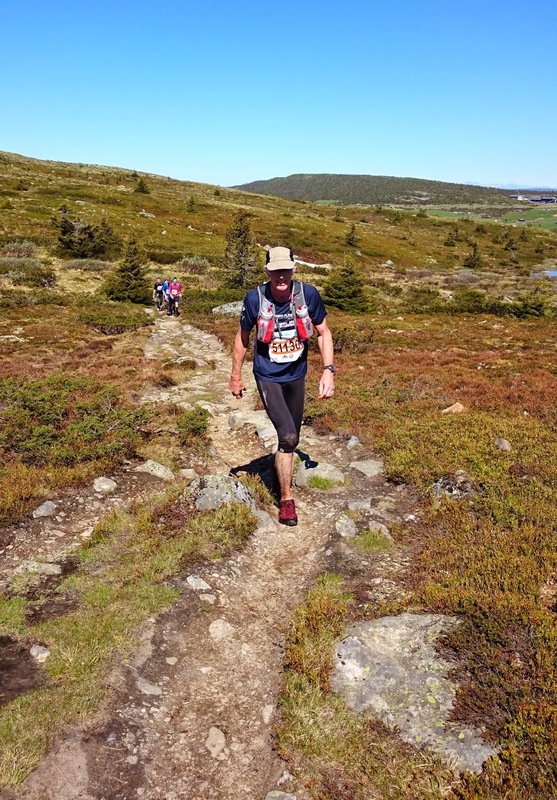 The numbers on my arm told me that I was on 7:30 pace when I passed through the km 32 aid station. Then all of a sudden, I have left the Dutch man behind. I realise that I am really, truly tired. My legs have started to ache. I think this is about the point an ultra becomes an ultra. When you are dead tired, but you are only halfway. My legs feel like they are starting to detach from my body, like they are floating. A girl in black lycra trots by me on a short uphill. I catch her on the subsequent downhill. When she catches me on the next uphill, I decided to give her a run for her money. She'll have to work to keep my back. I shake her off. I start to regret this - I am completely alone. Maybe it would have been nice to have the company. I'm starting to get bored, and force myself to focus on the words of songs stuck in my head. I sing my favorite running song, "Go the distance" from the Disney movie Hercules. If I can be strong. The next aid station is supposed to be at 39 km, but it never comes. Then I pass a sign that says that I am at 40 km. The aid station appears quickly after that. I drink water and sports drink. The water in my water bladder is running low, and I don't want to stop and fill it. I see my Belgian friend, stopped in the aid station and filling his water bladder. I shout a quick hello, and charge off down the trail, thinking that would be the last I would see of him. 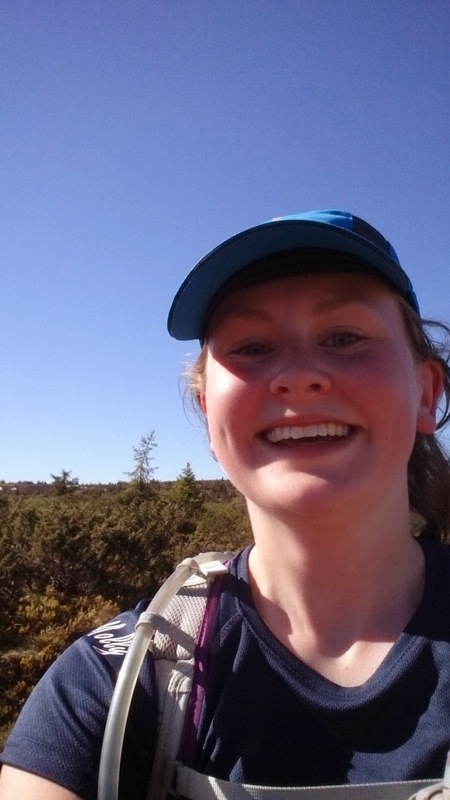 But he catches me quickly as we run along a dirt road that descends slightly and we start chatting. We are going fast, too fast. I decide to let him go. There are still nearly 20 km to go. The dirt road turns into an open bog through the trees. It is like trying to run on piles and piles of sponges. I highly disapprove. I catch the Belgian walking through the bog. I think he might be smart to walk, so I walk with him too. Then we finally come out onto a dirt road. 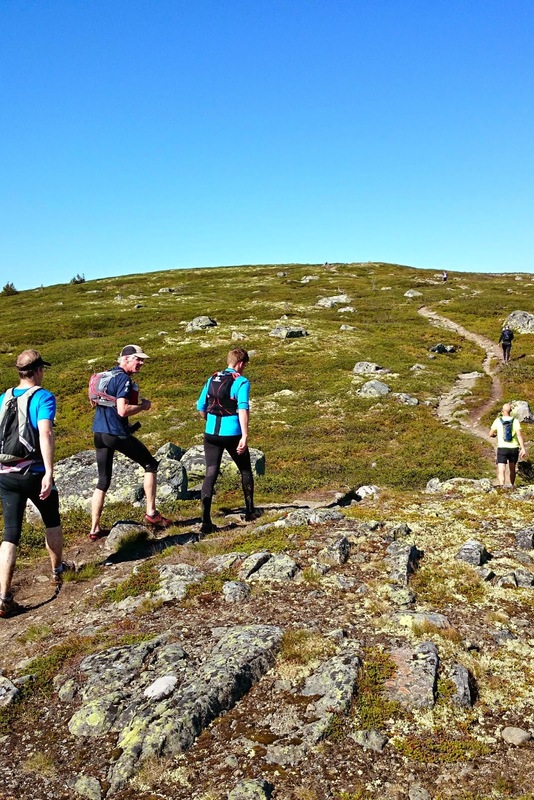 We are now on the regular Birken 20 km race route. There are lots of people without backpacks. Some of them are going very slowly, so slowly that even I can pass them on my tired legs. The Belgian trots out ahead of me. I think I have lost him now. There are signs every kilometer now. There are 13 kilometers left, and I have been running for 5 hours and 45 minutes. I start daydreaming about finishing in less than 7 hours. I realize how fast I have to run to finish in less that 7 hours. But it's all downhill, I think, you can run fast down hills. As I pass the 10 kilometer left to the finish sign, I remember the promise I had made to myself to run as fast as I could for the last 10 kilometers. I stop to pee, to get ready for running as fast as I can. I squat in the trees, out of sight of the trail. I think that I could just stay there, it is so comfortable to be still, to not be moving forward. No one would notice. Snap out of it, I think, get moving. My legs ache badly, but they don't hurt more if I ran faster. In fact, they hurt most if I walked. I reason that the faster I run, the faster I will get this over with. I have been running for 6 hours and 2 minutes, and had 10 kilometers to go. I feel like I am flying, I run so fast. There are plenty of people to pass, and this is good motivation. 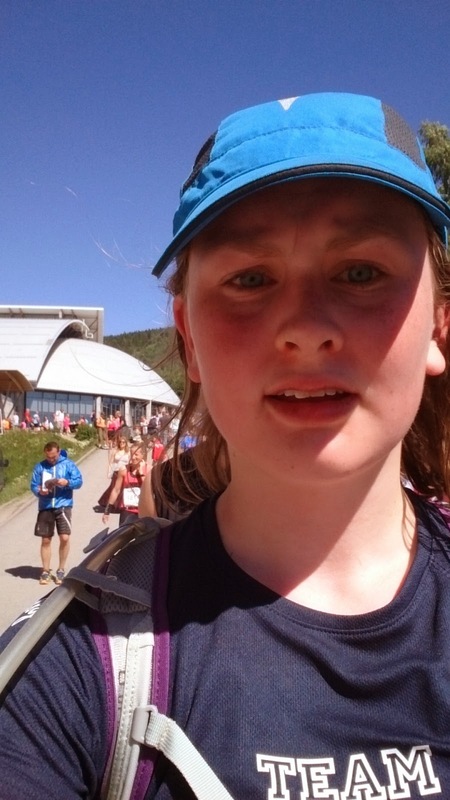 Some people pass me, but I remind myself that they have only run 10 kilometers (in the regular Birken race) rather than 50 km like me. My thoughts start swimming and detach from the surrounding. I focus on adding 6 minutes to the time on my watch every time I passed a kilometer sign, and check if I am at the next sign within 6 minutes. Sometimes I add wrong. Most of the time I can't even remember what kilometer sign will come next. I just know there can't be many kilometers left. I blow past my Belgian friend. He is jogging some and walking some. At the last aid station, with 6 kilometers left to the finish, a friendly volunteer sees the stripes on my race number. 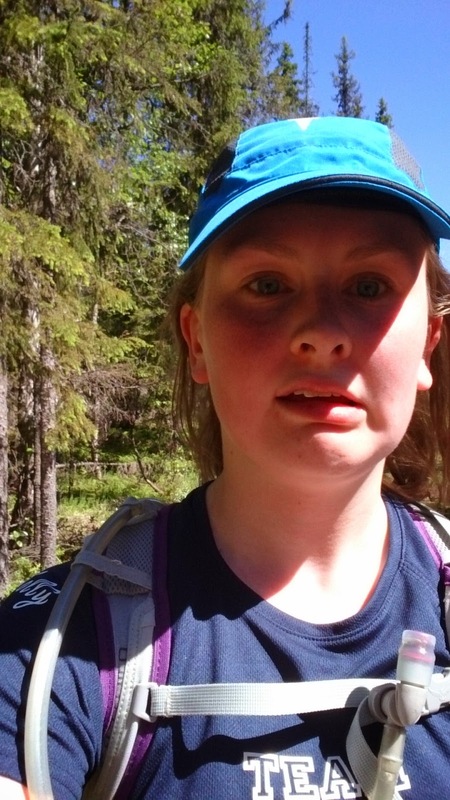 "Oh, you're running the Ultrabirken?!" she exclaims. 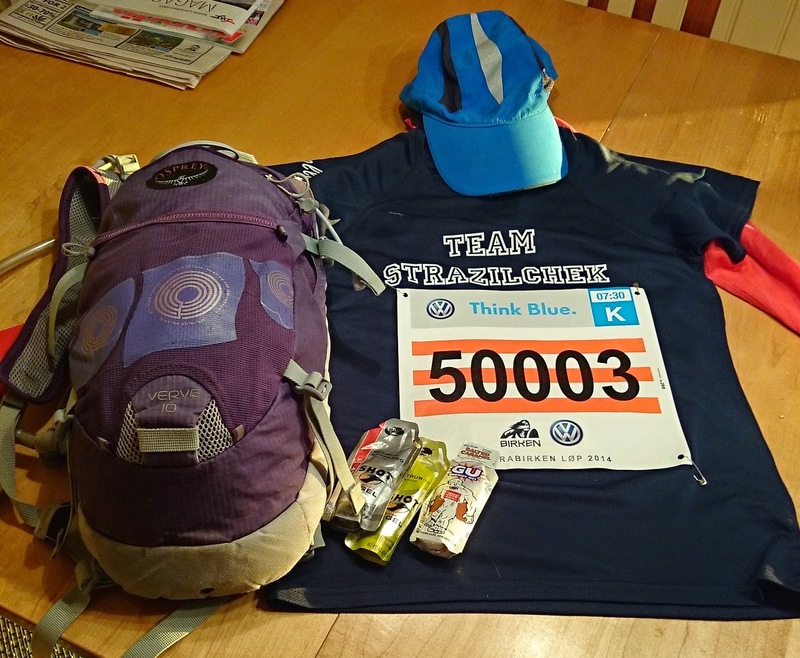 My race kit, and the striped number that allowed spectators to see that I was running the Ultra rather than the 20 km race. I nod. I remember that nodding means yes. I don't remember the word for yes. "Is this your first time?!" Nod. "How are you doing?" she enthuses. I dump water on my head and nod again. I don't know what nodding yes to 'how are you doing' means. But I also don't know if there are words for how I am doing. It's not how I am doing, it is simply that I am doing. 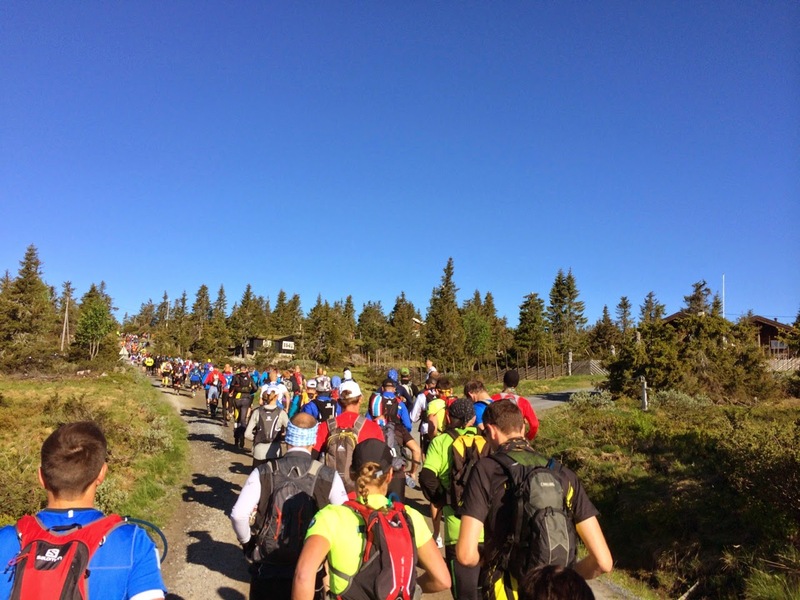 The last three kilometers are punctuated by a few steep uphills in the middle of the rolling downhill. Somehow, I haven't used up my uphill muscles, and I can sprint up them. This is fun. There are spectators watching the race now. "Go Ultra!" they yell, recognising the stripes on my start number. My watch says I have be running for 7 hours as I round the bend into the home stretch into the stadium. There are people, so many people. The announcers says my time is 7 hours and 38 seconds. I was so close to breaking 7 hours. I want to sit down. I want to cry. I have a headache. Someone ushers me away from the finish line. It's over. I walk through a tent where they hand out food. I take lots of water and a hot dog. I take one bite of the hot dog and throw it out. I want to drink water, so much water. The Belgian comes in 10 minutes after me and we sit in the shade. Dad comes in 40 minutes after me. We are Team Strazilchek, and we did it. According to my GPS: 60.4 km, 1203 vertical meters, moving time 6 h 48 min, average heart rate 167 bpm. Calories burned: 4474. So what do I eat now? Yay! Go team Strazilchek! Did you beat many of the women? Thanks! Yeah, this post was difficult to get right.